the long beige hallway, too familiar now. sometimes regard me from wheelchairs. "Take me home. I don't belong here". I would take us all home. She will accept our woven offerings. upon the flowers we cast in her. Saraswati's river sustains us to the sea. Lately I've been feeling it's so important to remember, be inspired by, and model the best of what human beings can be., in the face of such a concentration on the worst in the media. In other words, I need good news before I fall into cynicism and despair. So I decided to remind myself of the many unknown heroes and heroines, amazing people most people will never hear about. This wonderful documentary has lingered with me for weeks, and I felt like sharing it here. During part of the year, by the way, I rent rooms in my house like a B&B. I sometimes, but rarely, have Europeans visit. Strangely enough, in the way of synchronicity, as I write this I have no less than 3 travelling German women staying here, and a woman coming from Austria next week! None of them know each other, but they are all enjoying the unexpected opportunity to speak their native language in, of all places, far off Tucson! These women, an artist, a scholar, an alternative healer, are perhaps the children and grandchildren of the people who witnessed Hitler's rise to power and the horror of Nazi Germany. They are also contributing to the beauty and knowledge of the world................I don't know the meaning of this synchronicity, only that the film, and the synchronicity, leave me awed and reassured. Sir Nicholas George Winton, still alive and over 100, is a British humanitarian who organized the rescue of 669 mostly Jewish children from German-occupied Czechoslovakia on the eve of the Second World War. Winton found homes for the children and arranged for their safe passage to Britain. The UK press has dubbed him the "British Schindler". Just before Christmas 1938, Winton was about to travel to Switzerland for a skiing holiday, when he decided instead to travel to Prague to help his friend Martin Blake, who was involved in Jewish refugee work, who had called him asking for his help. A young, successful business man not even 30, he single-handedly established an organization to aid children from Jewish families at risk from the Nazis, setting up an office at a dining room table in his hotel in Wenceslas Square. This film, created by one of the children he rescued, documents not only the rescue work, but also the lives of many of the children he rescued, the contributions they made to humanity themselves, the thousands of people who came into this world, and contribute to its betterment, from his work. "Nicky's Family"...........an expanding circle. Remarkable! at corners of the mouth. an old coat the sun peels off with a touch. shiny as a new skin or fresh, primed canvas. 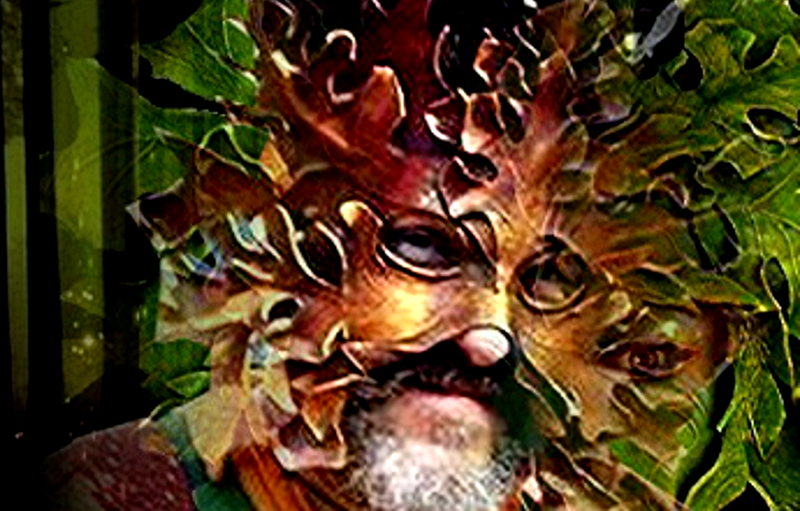 Somehow the Spring Equinox has arrived, this winter, as other winters, has been survived, the drumbeat of Mother Earth beneath feet bared is quickening, the hum of life vibrates, the budding of trees is again a cyclical magic. If I still lived in Vermont, as I once did, I would be hearing the sounds of snow melting in little trickles, a kind of underground budding and quickening reflected in the eyes I look into. 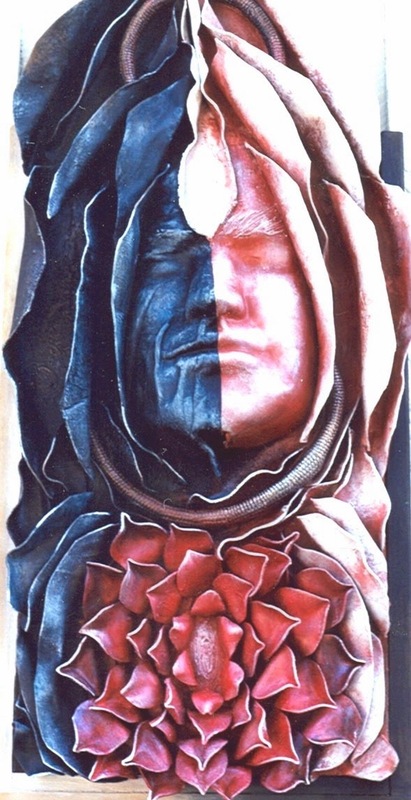 The Equinoxes are all about the constant Balance of life's seeming dualities, the serpentine movement from Death into Life and Life into Death, light and dark, yin and yang. To me, Persephone is the Goddess of the Equinoxes, because her journey from the underworld into spring is the transformative journey of nature. Before she earns her name, Persephone is Kore, the youthful aspect of the Triad Goddess, the naive Spring Maiden. In Greek myth, Kore, the daughter of Demeter, is seized by Hades, and taken into the underworld. 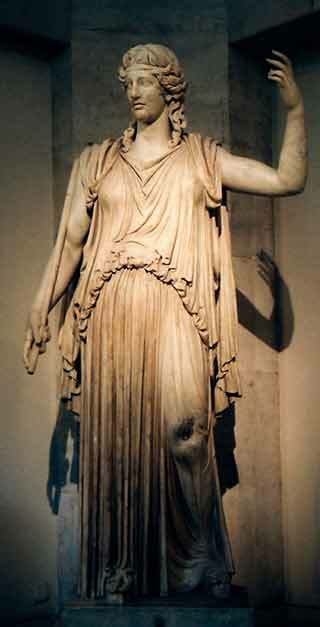 Demeter, in her grief, causes the world to die - no plants bear fruit, no bees pollinate, no flowers bloom. At last an agreement is made in which Persephone can be returned to her mother........but because the youthful Goddess has eaten 6 pomegranate seeds, she must return to the underworld for part of the year to be the wife of Hades. It is Hecate, with Her two torches, who assists Kore to return from the darkness into the world of light, and Kore matures into Persephone, the dual and integral Goddess of both life and of death. "Light is the left hand of darkness"
This myth partakes, and is probably derived from, the much earlier Sumerian myth of the Descent of Inanna, wherein the Goddess descends into the underworld realm to encounter her Dark Sister, Ereshigal, Queen of Death, and it is the husband of Inanna, Dumuzi, who must travel for part of the year into the Underworld realm to become the husband of Ereshigal as well as Inanna. 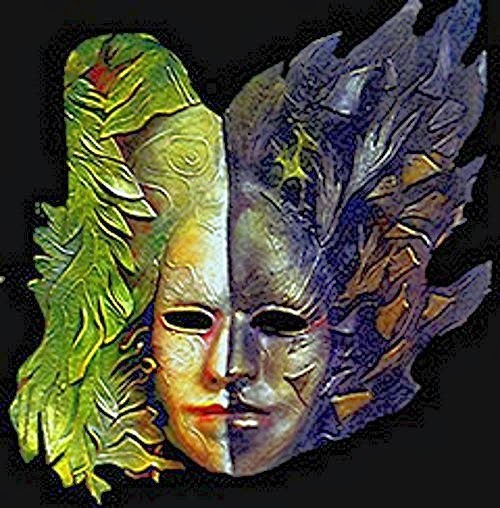 In both these myths there is great wisdom about not only the cycles of the natural world, but our own participation in these cycles, physically, emotionally, psychically. 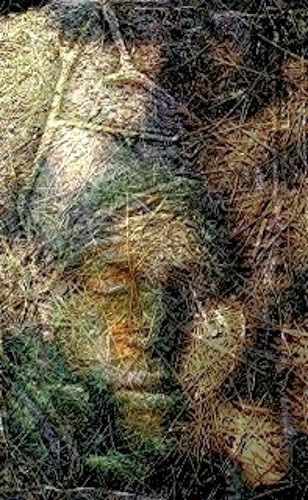 Without the sleep of winter there can be no exuberance of spring, without incubation there can be no birth. If we attempt to remain in perpetual youth, we cannot mature into the empowerment of adulthood. If we refuse to allow ourselves to grieve, we cannot heal and move into new ways of being. "Persephone did what Inanna did. Persephone's myth is about moving into a new state of being in the eternal cycles of life. All the soul riches, the knowledge, the art, everything was running down the drain into Hades and it stayed there. It stopped circulating. 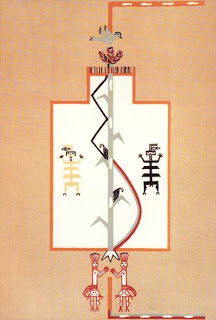 This was the myth of the descent of Inanna as well; everything went down to Ereshkigal, the keeper of the Underworld, and got stuck there in the universal unconscious. Ereshkigal, the mind of the underworld, was on strike - she refused to process. We can look at both of these stories, the stories of Persephone and Inanna, and see that these two Goddesses are pathfinders. Pathfinders to the unconscious, to the other worlds. Persephone, Kore who becomes Persephone, creates something new that was not thought of before her journey. And that's a very important myth for our time. And it's also why the Eleusinian Mystery, which was about Persephone and Demeter, was the defining experience of mature spirituality in the Mediterranean basin for 2,500 years." So today I, along with the shades of an ancient world and the unborn children of the future, honor the return of bright Persephone to the bright fields of her Mother, Demeter, Mother Earth, who is also the Mother of us all. May a deep understanding of Balance enter our world on this sacred day, to enrich the fertile seasons ahead, may that same Balance bless all our lives. For some reason I remembered a movie from the past that I loved, "Ressurection" starring Ellen Burstyn, and in trying to find it, which is very difficult, it brought to mind the groundbreaking work of Roselyn Bruyere and the Healing Light Center in Glendale, California. Resurrection is a 1980 film which tells the story of a woman who survives the car accident which kills her husband, but she awakes to discover that she has the power to heal other people. She becomes an unwitting celebrity, the hope of those in desperate need of healing, and a lightning rod for religious beliefs and skeptics. The film stars Ellen Burstyn and Sam Shepard, and was written by Lewis John Carlino. It was nominated for two Academy Awards; one for Best Actress in a Leading Role (Ellen Burstyn). 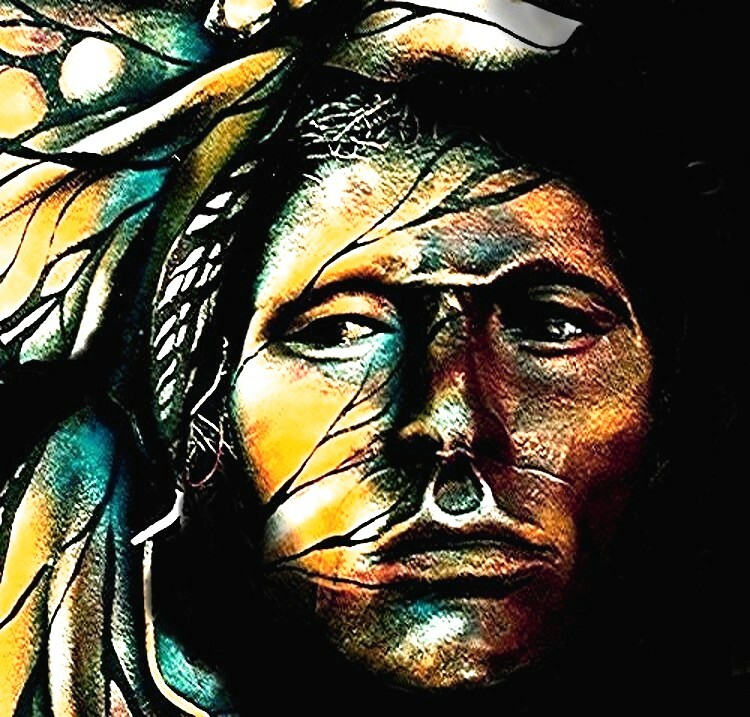 I remember hearing that the film was loosely based on the life of acclaimed healer Rosalyn Bruyere. While I can't confirm this, I do know that Bruyere was a consultant while the movie was being filmed, that Ellen Burstyn studied with her, and she and Burstyn remain life long friends. Rosalyn L. Bruyere is a clairvoyant and medical intuitive. Dual involvement in research and healing has provided a primary inspiration for Rosalyn's work. Using her skills in perceiving and interpreting auric phenomenon, she was instrumental in research conducted at UCLA with Dr. Valerie Hunt in which the existence and significance of the human aura was first proven and measured. It was here Rosalyn's capacity to "read" the human energy field was first noted. Her ability to see patterns of disease and behavior in detail and to energetically transform tissue at a cellular level has brought her worldwide attention and a reputation as one of the nation's most successful healers. So I was delighted to discover that the entire movie, a true classic, was to be found on UTube (hooray for UTube!). And here it is, well worth watching if one has the inclination or time. Artist Residency at Cherry Hill Seminary! It's my privilege to be the current Artist in Residence for Cherry Hill Seminary, the only accredited Pagan and Earth Spiritualities Seminary in the U.S., and I'm delighted to have this opportunity to participate in this important Center of Learning, epitomized by Hypatia**, teacher and philosopher of Alexandria. In the many years that I've been involved with the Pagan movement, and diverse Earth Spirituality, I've seen the Pagan movement "come out of the broom closet", braving often tremendous religious intolerance, to become at last accepted as a valid religious path. With the advent of Cherry Hill Seminary, yet another milestone has been passed, and I'm grateful indeed to the faculty, co-creators, and students of Cherry Hill for their accomplishment, and for the wisdom and learning that goes forth from this exciting collaboration. Cherry Hill Seminary is the leading provider of education & practical training in leadership, ministry, and personal growth in Pagan spiritualities. Cherry Hill Seminary gratefully acknowledges the kind permission of artist Max Dashu to reproduce her haunting painting of Hypatia. Click here to order a printed poster of Dashu’s painting. On a much more prosaic note, I went to Wickenburg with a friend, just missing, thank goodness, the Rodeo. But couldn't resist this picture by a statue of a famous old cowboy. I've been invited to enter a show here in Tucson, and for some reason, immediately wanted to enter my "La Mariposa" above. Perhaps it is because we are approaching spring. In her book “Women Who Run With The Wolves”, Clarissa Pinkola Estes wrote that the Hopi “Butterfly Dancer” must be old, because the work of pollinating the future is the work of age, of experience. I never forgot this, and have made many “Butterfly Women” as I myself approach old age. Without the grace of the pollinators there will be no future, whether we speak of next year’s crop, or the minds of the young. It's a job for one who has lived through many cycles, and can seed and generate the future from a solid base. "The (Hopi) butterfly dancer must be old because she represents the soul that is old …….Butterfly pollinates the souls of the earth. This is the translator of the instinctual, the fertilizing force, the mender, the rememberer of old ideas. She is La voz mitológica, the Mythic Voice." The Mythic Voice. How wonderful! 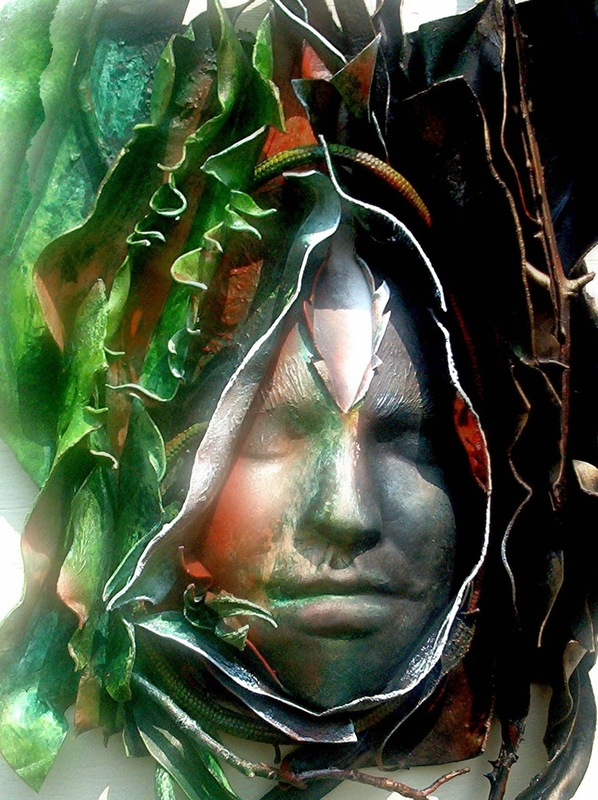 "Art is not a thing, it's a way of life"
It's May Day as I write, Beltane, although, considering the events in Japan, "May Day" may also mean a huge cry for planetary help. I love the painting above, which I found in a magazine; I don't know who the artist is, but thank him or her often for this "Butterfly Woman" from whom thoughts like butterflies emanate out into the world to do their work. 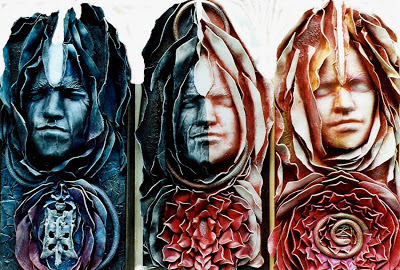 Perhaps the artist will forgive me that I do not know his or her name........but be glad that the work has gone forth to do its work in my heart and imagination. Pollen: agent of new life, new hope, transformation. As we (well, some of us) wind our way to the May Pole, and plant that metaphor into the still fertile earth, weaving our dreams into the ribbons of this ancient ritual of fertility, perhaps I can find a way to image the celebration of love and hope with a vast, global cry for help that sounds like a beating heart beneath the surfaces of our lives, just beneath our feet. As the drums and penny whistles sound, as we dance, may we all become Pollinators for our time, for the future. Like the woman who walks above, this is my prayer: May we have butterfly minds, pollinator hearts. 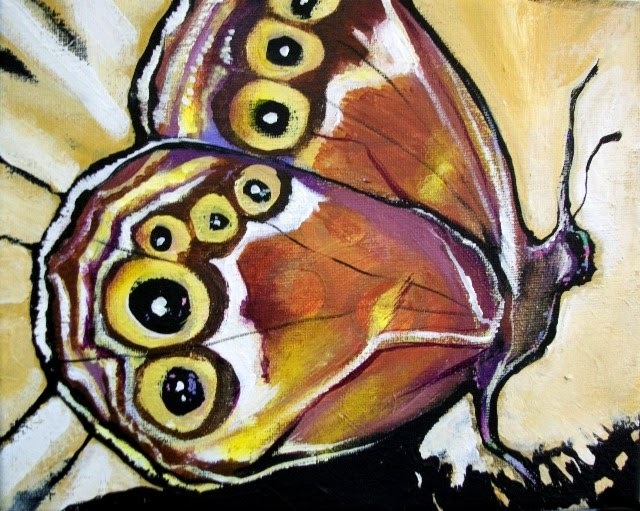 The ancient Greek word for "butterfly" is ψυχή (psȳchē), which means "soul" or "mind". And I have often found them mysteriously "soulful", as they seem to flit in and out of mystery. 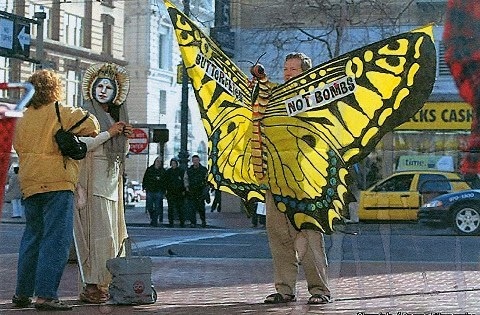 The picture above, for example - it was from the San Francisco Chronicle at the me of the great peace march against the incipient Iraq war, and shows three friends with their "soul icons" - me in the mask of Sophia, Alan Moore, founder of the Butterfly Gardeners Association, and Nicole, creator of "Cosmic Cash". Note that her icon, also, has occurred in this synchronistic photo. "When a caterpillar nears its transformation time, it begins to eat ravenously, consuming everything in sight. The caterpillar body then becomes heavy, outgrowing its own skin many times, until it is too bloated to move. Attaching to a branch (upside down, we might add, where everything is turned on its head) it forms a chrysalis—an enclosing shell that limits the caterpillar’s freedom for the duration of the transformation.....Tiny cells, that biologists actually call “imaginal cells,” begin to appear. These cells are wholly different from caterpillar cells, carrying different information, vibrating to a different frequency–the frequency of the emerging butterfly. At first, the caterpillar’s immune system perceives these new cells as enemies, and attacks them, much as new ideas in science, medicine, politics, and social behavior are viciously denounced by the powers now considered mainstream. But the imaginal cells are not deterred. They continue to appear, in even greater numbers, recognizing each other, bonding together, until the new cells are numerous enough to organize into clumps. When enough cells have formed to make structures along the new organizational lines, the caterpillar’s immune system is overwhelmed. The caterpillar body then become a nutritious soup for the growth of the butterfly." from Imaginal Cells and the Body Politic by Anodea Judith Ph.D. If we can see that our thoughts participate in pollinating the future, we can perhaps find ways of living with simplicity and honor, even in a time so very out of balance. Regardless of where one is, there is a profound need to "walk in Beauty". To be "on the Pollen Path". Without the grace of the pollinators, the butterflies and hummingbirds and bees, there will be no future. This idea is fundamental to spiritual traditions of native peoples of the Southwest, including the Pueblo peoples, the Navajo and the Apache. 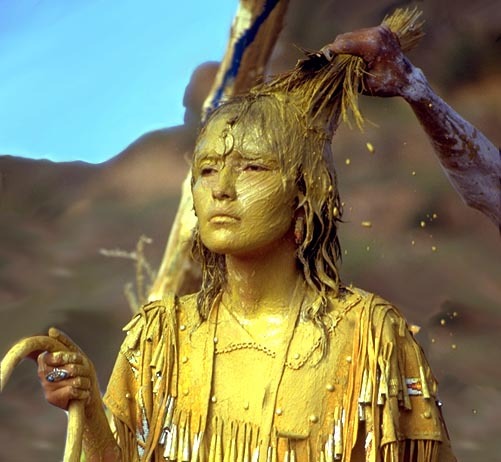 As shown above, when this young Apache woman came of age and entered into her fertile years, she was honored by the tribe with symbolic pollen. "The Pollen Path" is a healing and initiatory ceremony/concept among the Dine` that variously enacts a mythic journey, and demonstrates a cosmology of non-duality. "Pollen Path" art and sand paintings often show the union of opposites, such as red sun and blue moon, as well as mandalas, the balance achieved within the circle. In keeping with May Day, Psyche in Greek mythology was a beautiful girl who was loved by Eros, the god of Love. Here is "fertility", generation, pollination..........the union of soul/mind with love. As I imagine a "pollen path" for our time, and emanations of hope and beauty, I reflect as well that some butterflies, like the Monarch or the Painted Lady, are migratory. Monarch butterflies will migrate over very long distances, as amazingly frail as they seem. Some travel from Mexico to the norther parts of the United States and into Canada, a distance of over 2,500 miles. Lastly, a few thoughts from one of my favorite storytellers, Dr. Clarissa Pinkola Estes, on the work of the Butterfly Dancer. 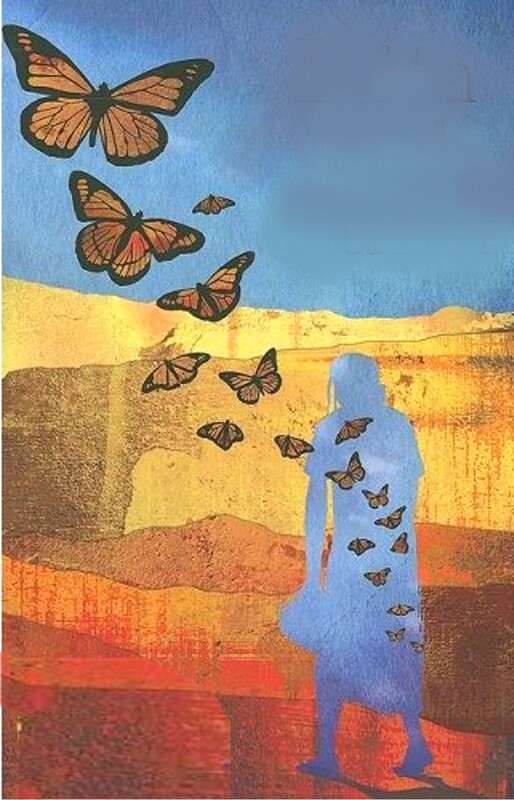 May we all, women and men, young and old, become Butterfly Dancers this May Day. 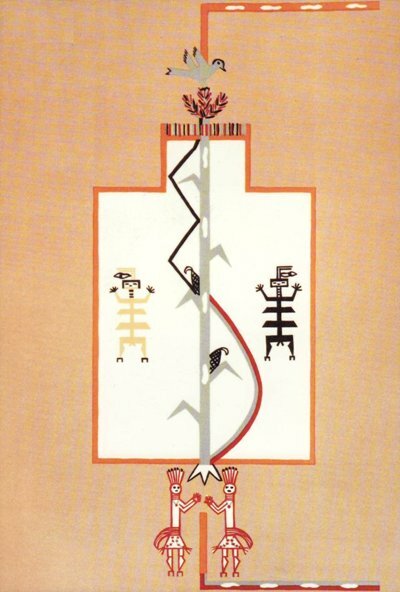 "The (Hopi) butterfly dancer must be old because she represents the soul that is old. She is wide of thigh and broad of rump because she carries so much. Her grey hair certifies that she need no longer observe taboos about touching others. She is allowed to touch everyone: boys, babies, men, women, girl children, the old, the ill, and the dead. The Butterfly Woman can touch everyone. It is her privilege to touch all, at last. This is her power. 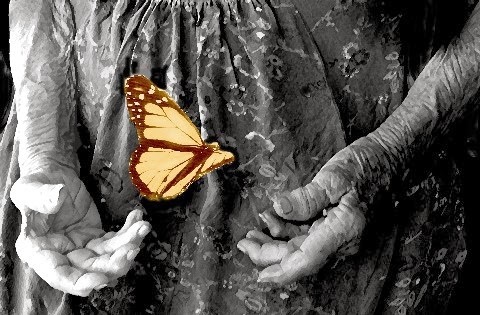 Hers is the body of La Mariposa, the butterfly." Clarissa Pinkola Estes tells the story of waiting to see the "Butterfly Dancer" at a ceremony. Tourists, unused to Indian Time, wait throughout a long, hot, dusty day to see the dancer emerge, expecting, no doubt a slender, ephemeral Indian maiden, and they are no oubt they were shocked out of their patronizing cultural fantasy to see at last the grey haired Dancer/Pollinator emerge, slow, not young, with her traditional tokens of empowerment. "Her heavy body and her very skinny legs made her look like a hopping spider wrapped in a tamale. She hops on one foot and then on the other. She waves her feather fan to and fro. She is The Butterfly arrived to strengthen the weak. She is that which most think of as not strong: age, the butterfly, the feminine." Because in the agricultural ritual these dances symbolize and invoke, call in, the forces that initiate the vital work of pollination, this is no job for for an inexperienced girl, no trivial token flight for a pretty child. It's a job for one who has lived through many cycles, and can seed and generate the future from a solid base. "Butterfly Woman mends the erroneous idea that transformation is only for the tortured, the saintly, or only for the fabulously strong. The Self need not carry mountains to transform. A little is enough. A little goes a long way. A little changes much. The fertilizing force replaces the moving of mountains. Butterfly Maiden pollinates the souls of the earth: It is easier that you think, she says. She is shaking her feather fan, and she’s hopping, for she is spilling spiritual pollen all over the people who are there, Native Americans, little children, visitors, everyone. This is the translator of the instinctual, the fertilizing force, the mender, the rememberer of old ideas. She is La voz mitológica." "La voz mitológica". The mythic voice. The Mythic Voice re-enchants the world around us, lending luminosity to each footstep, and pollinates, energizes, en-chants those who hear. It is transparent, permeable. And one way to walk the Pollen Path.